Hi Andrew, just letting you and the team especially Trent know that after your excellent service changing our DP Chip over to the new model the Prado ran beautifully especially towing the caravan on the trip home. The vehicle ran a lot smoother and seemed to get better fuel economy I’m very impressed. I have just finished changing my fuel filter from secondary to pre as per Trent's recommendations and am about to order a catch can. We checked out the great little town of Berrima when we left you and would have stayed down on the river but all sites were full, maybe next time. Thank you all once again for service well beyond my expectations. I have a DPCHIP best thing I have done it is not the same so much better in every way. Traveled down from Campbelltown today, bit of a headwind, sat on 100 km per hour, computer showed 13.6 litres per 100 km. On the trip home, tailwind, sat on 100 - 120 km per hour, computer showed 7.6 litres per 100 km. Even allowing for the difference in terrain and wind direction, it was a big difference - much more than I expected. Can't wait to see how we go with the van on the back. DPCHIP and service done today by Berrima Diesel Service - The Diesel Experts on my Triton couldn't be happier. Can notice the power difference straight away, also all the staff were very helpful and friendly. Cant recommend them enough. Catch Can is next. I have a dp chip in 08 d4d Prado and I am very impressed with the overall performance and the better fuel economy. I installed mine yesterday on a 2.8 crd jeep Wrangler. First impressions are almost no turbo lag and a huge kick in torque. Extremely good value for money. Guess it's time I reported back after the fitting of the chip to my land cruiser workmate a couple of weeks ago. The increase in power is incredible. The difference in torque while towing is exceptional. The fuel economy is also a great improvement. 17 liters/ 100 k towing a 3.5 ton van. Leaving the van at home it managed 10.6 liters/ 100 k combined city and highway. Hi,my name is Steve Moon and your team fitted a DP CHIP to my Defender 90, on May 8. Have travelled 1000+ km since then,over the Barrington Tops,to Nundle via a back road,to Uralla,and home to Maclean. This covered a variety of roads,bitumen and dirt, serious ascents,and fast highway sections,a fair test for the Chip. I am amazed at the difference . Even with a FULLY loaded vehicle ( no rear seats,just camping and sporting gear,) hills that were previously a bit of a struggle,became a breeze. Overtaking on the uphill sections was easy,even fun. And to top it off, fuel consumption was a pleasant surprise, returning km per tank very close to previous unloaded figures. So,very impressed and satisfied so far,and that shouldn't change. I got a plug and go and a dpchip in my 2013 d22 navara 2.5 now i can tow my van man thanks dpchip. The Fort is going great! Getting the Bang for the Buck! Worth it! Just wanted to give some positive feed back on my experience with bremmia diesel and the DPchip and exhaust package. I have a 2013 TD Toyota prado auto , I have had it since new it has 37000kms on it. About 8 weeks ago I brought a new caravan that weighs just over 2t loaded. We took it out on its first trip and while I was happy with the van I was really disappointed with how the prado towed it , it was sluggish as hell and seemed to be lacking power even on straights. I was so unhappy with it I was thinking of selling it and getting something with an extra couple of cylinders, I checked over the engine and couldn't find any reason for why it was sluggish.But I got told about the DPchip so I looked into it and the back up support looked good and the warranty is fantastic. I brought the DPchip and 3in exhaust package and yesterday I put the exhaust on and my god it's a different car , it feels like it wants to go, the seat of the pants difference is so much more than I could of asked for and I'm only in the standard setting. The prado tows the van with ease now and I have only done a quick test trip but the difference is night and day and it looks like I might save a couple of liters per 100km as well. Overall 5 star ratting in my opinion. The kit was $2100 delivered to outback WA and worth every cent. They sent the chip out straight away and the exhaust rocked up 2 weeks later. The exhaust fitted straight on with no dramas. I have called tech support once just to make sure I understood the instructions for the chip and they were very helpful. Best 2k I have spent in years. Had one on my 79series cruiser an now one on new Hilux no problem. The best mod I have on my 200 series. Good company, great support. I have no affiliation or interests in the company. Keep up the great work. My d22 navara pulls my 2 ton off road caravan great now with dp chip thank you. This is not an enquiry as such but a quick note to say thanks for the service I recently received from the team there at DP Chip. Just wanting to say a big thank you for checking out and returning my DP Chip to me with a minimum of fuss and excellent turn around time, gives me a lot of piece of mind dealing with you too knowing that because no issues were found with my DP Chip that I wasn't overcharged for the service either! I will happily refer all my friends to you when it comes time for them to upgrade the performance of their turbo diesel vehicles going forward, happy in the knowledge that not only will they get vastly improved performance and driveability but great after sales backing too! Had one fitted yesterday and noticed a difference straight away I'm impressed can't believe the difference it made . I have your chip in my 2013 SR5. I love it. Power and economy. Awesome. My Nissan Navara STX 550 has a DP chip, a 3” exhaust and a K & N filter. It performed quite good but I have just fitted the Plug and Go and now it is a missile. The difference it makes to the control of the engine is quite remarkable. Would recommend these items to anyone who wants better torque and better control. Fitted a DP Chip to our Pajero last Dec. The extra power and torque, especially when overtaking, is quite noticeable. It also made a saving of 2 LPH on fuel economy. The low range revs are where you particularly notice the difference. It eliminates that "turbo lag", most diesels suffer from. Excellent, no problems to report after towing the van on many trips this year. Thanks heaps, part arrived on Friday, overwhelmed with the urgency of freight, fitted it up yesterday and i think it's great, 2 mates have driven my ute and are impressed by it and the differences it has made, only thing disappointing about it is I have to wait until June to try it out for myself :( would definately recommend the part to all and to people to buy from you, once again thanks heaps, and I'm very impressed with product. I recently purchased a DP Chip for my 2015 Isuzu DMax and had it installed by a local mechanic. Its only been a week but I have noticed a substantial change in the vehicles performance. Its delivering as promised. The acceleration is quicker and smoother and the "grunt" is outstanding. No more dropping down from 5th to 4th going uphill, I can actually still accelerate in top gear travelling uphill. Apart from the on road driving I have done a bit of beach driving over the few days and the DMax traveled the sand better than pre chip. Great work. I was contemplating a remap before deciding on a DP Chip, glad I chose the chip. I must confess a remap concerned me, I was concerned that the remap would produce the promised figures which were high. My concern was the drivetrain having to cope with limits above what it was designed for. I wasnt interested in replacing clutches either. Anyway, loving the DP chip, love the DMax and I would recommend it to anyone contemplating it. Thank you for your service yesterday. The fitting of the DP Chip was was noticed straight away. I used to have a very slight lag on take off, now gone. On the highway back to Sydney the motor used less fuel and slightly less revs. Even though I have not towed my van yet , I am sure It will tow much better now. I will not hesitate to recommend your product or service to anyone. After years of procrastinating finally had a chip installed for my Holden Astra and now wondering why I didn’t do it sooner. There is a noticeable increase in its performance without any additional fuel costs. I will certainly recommend DPChip to anyone who will listen. So, naturally, very happy with the chip but I would also like to comment on the service provided by the staff. I was allowed to watch the installation of the chip and given a comprehensive explanation of how and what it does. Very enlightening. However, my highest praise is reserved for the reception staff. I won’t do into details but Jackie, the receptionist, went out of her way to resolve a banking issue that I had. As an old timer I have been around a bit and I can honestly say I have never received better service. So, for both an excellent product and outstanding service I give DPChip a triple A. Your chip has made my 2013 Hilux awesome! After having my Prado chipped by you it performed extremely well driving back to the West however as the Prado couldn‘t legally tow our new van we brought our 100 series L/C Sahara to you to do the 3 exhaust, Chip and dyno tune well mate thanks the car runs better that the 200 series I drove, you and your team do a fantastic job and I would recommend Berrima Diesel which I have to any and all I met. Unfortunately you are too far from me to have you service my car but when I am in NSW again I will certainly have you guys service and tune my vehicle. Hey guys. Just like to let you know I'm very happy with the service you provide. I recently spoke to you about my common rail patrol and the second hand dp chip I have. It would put my car into limp mode. Any way I sent it to yous and got it back with a tip to check my fuel rail release valve. Which I did and bought a new one straight away. Never heard of the problem with these before this. My car runs awesomely now with the power I want. Cheers guys, you were able to help from across the country. One thing I regret about the DP Chip.......is I should have brought it sooner. The difference in power and torque with the chip is mind blowing. Hi DP Chip team. I received my chip yesterday. Thanks for the email. I have installed the chip and I am very happy so far. I have only driven briefly but can already notice an improvement under normal driving. I will be recommending your product to several people I know. Once again thank you. Recently installed one on my 09 hi lux. Couldn't be happier. Wish I did it 12 months earlier before other mods. I've had the DPChip on my FM2632 for a few months now, has gone from a slug to a rocket, fuel has also improved by around 4%! Had my 2011 TD Pajero fitted with just the chip, pulls a 2700kg caravan with ease. I was stoked when I rang the DP Chip number and got a guy who knew what I was talking about when I described my engine mods and asked what setting I should use. My V8 Cruiser ute has never been better, especially when coupled with the throttle response modulator chip (plugngo.com.au). I actually get better economy when I'm not driving it like I stole it. I've had my DP Chip in the hundred for about three months now, I fitted it along with an upgraded intercooler and can't believe the difference it's made. It drives like a brand new truck with so much more throttle response than before. We've kept the chip on setting three and so far am really happy with the performance. Thanks for the great product! Actually, I'm sorta annoyed I didn't do it sooner. I've have this vehicle for 11 years and to think there was so much potential in the standard engine..... Should have done the upgrade years ago! My 2011 zd30 patrol auto has one, 3" exhaust..... Really happy with there product and want to get the PlugNGO accelerator curve also. Yep DP Chip on the RG Colorado, 3" exhaust and HPD Intercooler and my Collie goes right. Tows well and always plenty of power. Might be cheaper ones out there but sometimes ya get what ya pay for. I'm a happy customer. Put one in my Ranger Wildtrak and getting 12.5 ltr 100 pulling my 3 ton van. Safest diesel tuning device available‘ Will vouch for that. Installed at my 30,000 service and DPChip and Golf TDI still going strong at 313,000. 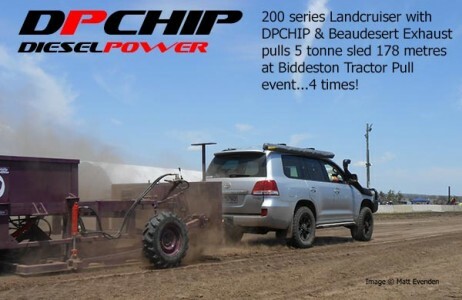 Just writing to let you know the results of fitting a DPChip to my 2002, 95 series Prado, auto, having 235802 kms on the clock, and towing a caravan @2000 kgs. I was hoping to get more power/torque in the drive range at around 85-90 kmph, which is @1900rpm, a speed at when the auto is in the high range, however upon reaching a slight rise in the road it would drop back a notch and run at 2600 rpm until over the rise (not using cruise control), so more revs = more fuel, not good on the leather in the hip pocket . Well after fitting it myself, in around 45 mins, I did not tow the van for 2 months, so was anxious to see what difference it had made.Without the van on I knew the power was a lot better straight away, and fuel usage was already down .5 litre/100km to prior to chipping . When I did hook up the van and did the first run, which incidentally was on the same route as I had done before the DPChip, I was amazed at the power and more importantly the extra torque that I now had under the loud pedal. It was wonderful to watch the revs hold on slight rises where before it would drop back, and not only that, once over the rise how quickly it would pick up revs. Before chipping, revs would drop back to about 1600rpm then change down, now in the same situation it drops to 1750rpm and holds it there. Could not get the smile off my face, my wife could not get over why I was smiling so much on the trip ha ha . Ever since I have had the Prado (bought 2nd hand with 230000 k‘s) I record all fuel usage, kms, and where journeys are taken, so I have a good record of fuel consumption, so after the trip with the van on exactly the same trip, I was anxious to see what, if any difference the DPCHIP had made for the money I had spent. Below are the figures so far . The van trip was over approx. 1300 kms return, including 600kms touring without the van, but it still is only 1.02 l/100 kms more than all running without the van local. So I guess from the above figures you can tell I am one very satisfied customer and feel free to use this testimonial as you like. I have some good feedback to share with you all. We recently fitted a DP Chip to a new Nissan Navara D22 with the 2.5L CRD which he just updated from an earlier model, also with the 2.5L CRD. As we have been looking after him and his vehicle for a while now he decided to take our advice and get the DP Chip fitted through us instead this time. He dropped in yesterday to let us know how pleased he was with the chip and how much difference it provides compared with the other unit. He has said there is definitely more to go, both in low down torque taking off and when coming up through the long climb to the Adelaide Hills it will now hold 4th gear instead of having to drop back further. The other thing he has noticed is the improved economy where he now gets around 550km to a tank instead of 500km. The major point he has noticed is the lack of black smoke compared to the previous vehicle with the (*Brand name removed) module. He was always concerned about the smoke with this other unit, as it was always there. At one point he did have a cracked exhaust manifold which the dealer replaced under warranty, and he now wonders if the excessive fuel/black smoke issue contributed to this. Anyway, he is very happy with the DP chip. We continue to get lots of good feedback from clients, but this is one I thought you may be interested to read about. If people stick with a DPChip to tune their electronically controlled diesel they will be in for trouble free operation. I have had one on my Golf TDI since about 30,000km, not a problem with it still at 304,000km. Many Thanks for your advice today. I would like to apologise for ringing on the weekend, but your advice got my son home and I will ring you to get it booked in on Monday. It has just ran out of Warranty, so hook in and work your magic. We have just completed a big trip up north and mate are you sure you didn't put a Super Hornet engine in my motor home, it is getting better every time I drive it and flying with that chip. I purchased a chip for my new Great Wall V200 which had terrible, terrible turbo lag, fitted it myself in about 15 mins. It was super easy! I'm happy to say that the chip , although it didn't remove ALL of the lag. . It did remove around 80%. It has made a massive difference to the way it drives now. Fuel economy has improved out of site too? I now do 748 klms, (around town) on 61 ltrs. That's an increase of. . . . . . .well I don't know but it's a lot! I've not to had a chance to see what the highway economy is but if the round town has improved that much I'm certain it will be impressive. What a difference the chip has made to the Great Wall! I'm very pleased with it indeed. Ive got the new double cab 79 series.. carry heaps of gear with all the extra 4x4 mods now have a dp-chip, 3-in exhaust and high flow air cleaner, the car now has more power, WITH better fuel economy, dealership didn‘t even care that it was installed... your mad if you don‘t install a chip like this on any of the diesels these days. Dropped my fuel economy by 4L per 100k - bought one for my dad has the latest prado- pretty basic and dropped the fuel by 2L per 100ks and better performance towing! With the DPCHIP I save roughly 1 litre per 100km around town. I now take roundabouts in 3rd gear and my Triton climbs back up to speed limit smoothly and effortlessly. I installed the chip without any problems to my hilux. I am extremely happy with the difference it has made to my car. It now has quite a substantial power increase and I am experiencing better fuel economy. I am very happy with the product and would highly recommend to anyone. I have a 200 series cruiser wagon with your chip and a Beaudesert exhaust with a few other mild mods like snorkel and K&N filter, EGR block ect. It is hard to really get a feel of the pulling power of these things on std road driving and unladen so when I attended the Biddeston tractor pull on the week end and was given the opportunity to hook up to the sled I jumped at it. A few V8 cruiser utes, 4.2 Patrols, 4.2 100 series and a 4.5 petrol 80 series had a go and all got between 70 and 80 mtrs until the 5 tonne sled pulled them up. I hooked the 200 on and gave it second gear low range with the tyres down to 25 psi, can you believe it went to 3rd and then after a bit back to second and then finally first and pulled that sled right off the end of the track at 178 meters see picture of 2 wheel ruts off the track from the 4 wheel skid all the way! The crowd was in disbelief so I eventually did 4 runs all with the same result. That was a 38 degree day and there was no sign at all of overheating nor was there any black smoke. Just wanted to let you know as I may have done the first Aust sled pull in a 200 series cruiser! Gday, I have been unable to register on line as the booklet stated, so my registration is in the post. Also the performance of the Triton as far as turbo lag is only marginally improved, is this as good as it gets or should the chip have a different setting.Torque has a definite improvement and once the lag goes power is noticeable too.Fuel consumption is about the same which under tow is 6 km per ltr give or take on terrain, this being as before fitting. Your not getting it back!!! !Unless of coarse you can improve it. Thanks very much,good product. Just returned from our first towing trip after installing the DPChip. We are using a 150 Toyota Prado to tow a 2.5 tonne caravan. The increased torque is really noticable (as an example, we were doing 100 at the Hawkesbury Bridge heading south and not using cruise control : at the top of the hill we were doing 92 with the same throttle opening all the way). And that‘s a fair sized hill. What can I say but I‘m inpressed. I appreciate the way you resolved the problem with the chip. Since then it hasn't missed a beat and I have been very happy with the improved performance. The Prado is so much more responsive and therefore more enjoyable to drive. I will certainly be recommending your DPCHIP to anyone that could be interested. The vehicle (current model Isuzu Dmax) has much better mid range response and towing the boat up to the dam used 1 litre per 100km less than it did before on the same return trip. Down to 11.9 L/100. Very impressed! I would just like to say how thrilled I am with the DP chip installed through Peter Finch 4x4 recently. Not only is the torque and power increase very noticable but the smoothness and quietness improvements have been impressive. It feels like a car engine rather than a heavy diesel now. Why don't the factories do this? Well done and keep up the good work! Thank you for the DP chip. I installed it easily and it works.Couldn't be happier with the result. It really does transform the engine.I've recommended it on the GWOF website, hope you get some more orders. Hi guys just like to stay how great your DPCHIPs are and your service. Can‘t thank you enough for all your help and standing by your product, fantastic! My friend has also noticed power improvement in his 4wd and is very happy. Couldn't recommend dp enough. It is important to advise your Motor Vehicle Insurer that you have a D P Chip fitted to your vehicle when completing accessories or modification section of your Insurance Proposal declaration. The reason is so the Insurer can increase the vehicle‘s value in the event of a total write off claim and NOT for the reason that they can impose an extra premium of refuse a claim. We have contacted both of our Motor Vehicle Insurance underwriters through our Brokers and they have no issues with fitting a DPCHIP (they are different to other Chips available on the market) providing it has been stated on the proposal form or they have been advised that a DPCHIP has been fitted at a later date. 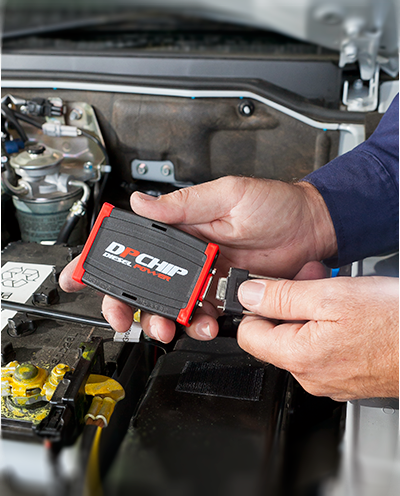 We have used DPCHIPs in all our fleet vehicles for some 5 years now without any Insurance issues. I have installed my DPchip into my VW T4 2.5TDI this weekend. I am very pleased with the increase performance. I tested the vehicle on a strech of road, with a very long hill climb, where previously 3rd gear was required. With DPChip installed the vehicle made the climb without changing gears, in 5th gear. I had a DP Chip fitted to my 2006 Nissan Patrol 3.0l about 3 years or so ago. This has worked very well and made the vehicle much more driveable especially when towing my 2.5T caravan. I am very happy with it. I have just had a 3 exhaust fitted to the vehicle and the ERG valve attended to. My query is that having had this done, do I need to have any adjustments made to the DPChip? I run it on no. 6 and all seems well. The DP chip has been installed for several months now and has taken us on several trip including a 12000km trip thru' the Middle East (Across UAE, Saudi, Jordan, Syria, back to Jordan and across the Sinai Desert into Egypt and then down the Nile to Sudan before retacing our steps. The car was heavily loaded but performed fantstically and reasonably economically. As a result, several friends have also bought DP chips whilst visiting Aussie - all are satisfied. Andrew reprogrammed the Chip in Captiva to maximize its performance. Summary Budget Cabin accommodation over 2 nights, 1,875 kms is $45.35 more coslly than towing your own caravan. Towing cost 17.6 cents per kilometre. This could effectively rise to 20 c per kilometre to equal same cost as using accommodation not towing or a fuel price rise of 17 cents per litre. So far very impressed. Has taken the lag out at take off. Drives more like a petrol v8.m Much nicer to drive in traffic. Special thanks to megan for all her help when the chip was delivered to the wrong address. So far 10/10 . Have just fitted the DP Chip to our 05 3lt Nissan patrol. This is now our 2nd Patrol as well as a Nissan Navara 3lt which were both fitted with "plug in,drive away" type chips of another brand. We were very happy with the previous units and were reluctant to change, as we do a lot of outback driving and towing (19' 6 off road full van, 2.2 tonne). The difference the DP chip has made is tremendous!! Nissan sales would double if they fitted these units standard. The difference between the DP Chip and our previous power up units is far superior. The whole deal from your reception to the end result has been a great experience and worth every cent. Thank you all. I have just purchased a DPChip for my hi no Tudor 6500. I was so scared paying so much money for a small box and a few wires. But as soon as I drove out of the workshop I said to my friend this little box will stay forever. And when I buy another Truck I will buy another DPchip. And I will recommend to every one. Three of my co workers already ordering theirs. I could not even imagine what a product. Way to go guys you are tops! Bought my chip second hand approx 10 months ago (had been used on a Nissan Patrol.) As I was having problems with it (Chip was programmed for a Patrol not a Landcruiser) I sent to the company and they tuned it for my landcruiser 100 series turbo diesel. After which there were no problems. Installation took me about 2 hours and I am a novice. Have travelled approx 20,000 klms through the territory and W.A on and off road towing a 2,000 kg Kimberly Caravan. Both vehicle and Caravan fully loaded. Fuel consumption averaged out at 13.5 ltrs/100 driving conservatively at around 85 kph. Locally with conservative driving up to 95kph over 2,000 klms I am averaging 7.8 ltrs/100. (Local driving was mainly with unloaded vehicle with the occasional trip with a 6*4 trailer fully loaded.). I am very satisfied with the chip and would certainly recommend. Thanks for your fantastic technical support recently. The DP Chip is installed and working really well. As soon as I revved the engine I was a bit surprised at how easily it revved through the range from 1000 - 1800 rpm, then it just took off! The road test also showed a VERY nice increase in power in that previously doughy region - so much easier to drive. The performance in the rev range above 1800 rpm reminded me of my CDTi Astra 1.9liter 6 spd manual - this is great, and still on setting 5! Once again thanks for your great customer service and technical support. The DP-34 I fitted to my Nissan Patrol 3L. Can go up a gear 10km/h earlier. Towing our van - vehicle + van - 5+tonne Ever so fluid and smooth, changing down reduced dramatically. Average speed would be up 10km/h - Fuel Use down from 5.5k/l to 6k//l. I have recently put one of your chips on my 2005 toyota landcrusier. I have also put on a exhaust and intercooler. Just had it dyno tuned and it made 136kw at all 4 wheels. It made 89 stock. I am very very happy now as the 4x4 is now a speed machine. 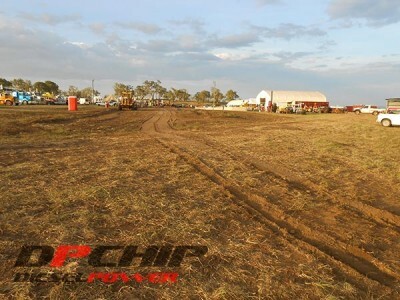 Hi,I received the DPChip and successfully fitted it to my Hilux. Quite easy to fit and I must say there is a significant improvement with the DPChip. Hills and overtaking are no longer a problem. I'm even using less fuel. Thanks for all your help. I've got a DP chip in my 13' Suzy TD Grand Vitara & it has made a good 4x4 engine into a BRILLIANT 4x4 Engine! Soo much smoother, more power, no flat spots, less turbo lag, power higher in the revs, so much nicer to drive. Worth every cent! Before the DP Chip it felt like you were fighting the engine to get the most out of it. Now with the Chip it feels like the engine is giving its maximum performance all the time, Smoothly! on the way back. Instead the vehicle maintained our expressway cruising speed of 95Kmh without faltering. On further trips we have to use the gears less and indeed pass over many hills / grades with no difficulty in 6th gear where we needed to change before. Remember that we set the cruise control on 95Kmh and we do not increase speed at all when approaching steeper hills. The motor holds the higher gears far smoother and more consistently. Through traffic the vehicle is much smoother in acceleration whilst using less revs and in fact we back off considerably in order not to keep pushing the traffic in front. Indeed the vehicle can be driven quite leisurely in traffic, compared to a greater concentration factor needed before to fit in with traffic flow. There has been no relative increase or decrease in fuel consumption, our trips have been relatively short 200 to 250 Cams with city travelling include in all trips. We would expect a slight increase in consumption on longer trips and in flatter terrain as the vehicle now travels far more evenly even where there are rolling hills. It is now difficult for us to have a vehicle WITHOUT one of your chips fitted because we know just what a difference they make. You can use me as a reference any time.